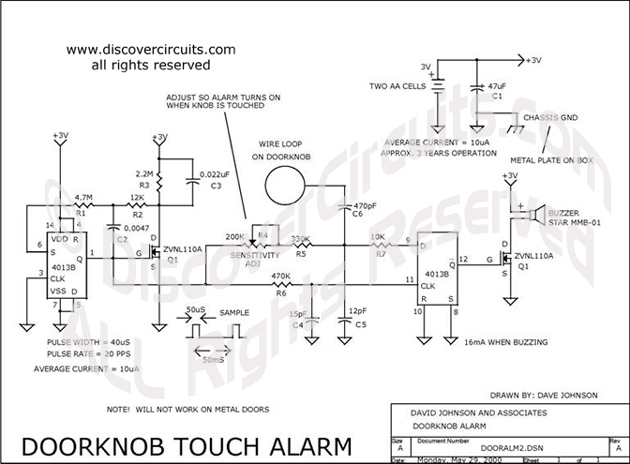 Circuit: Doorknob Alarm__ Circuit designed by David A. Johnson, P.E. Many companies offer simple alarm devices for personal use in bedrooms or hotel rooms. A metal chain attached to a box holding the electronics is placed around the inside doorknob of a wood door. Anyone grabbing the knob from the outside is detected by the electrical capacitance change that occurs from the human hand contact between the knob and the box. Almost all of the commercial devices sold use a more expensive and power consuming radio frequency circuit approach to detect the capacitance change. But, a very inexpensive and micro power technique can also work. This circuit schematic should dramatically reduce the cost of the device and allows it to operate for many years from one set of batteries.